President Obama on Monday pardoned 78 people and commuted the sentences of 153 others, setting a record for the most acts of clemency by a president on a single day in U.S. history. 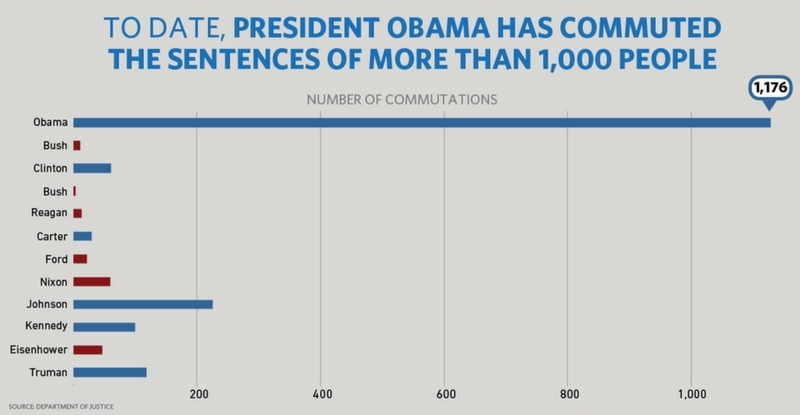 According to the attorney, Obama to date has commuted the sentences of 1,176 people, including 395 life sentences, and granted a total of 148 pardons. The latter total has him still pacing behind his recent two-term predecessors for pardons, but far-and-away ahead in the number of commutations. A commutation changes the sentence but does not wipe away the criminal record for the criminal offense committed, while a pardon does. According to the Justice Department, Ronald Reagan granted 393 pardons, Bill Clinton, 396, and George W. Bush, 189. Obama stated this summer that his clemency program is aimed at commuting the sentences of those criminals who are in jail under tougher sentencing guidelines than currently exist (such as the “three strikes” laws), including particularly those whose main underlying offense was drug-related. The Washington Post notes that the Obama administration is working with the Clemency Project 2014, a consortium of four groups that is supplying lawyers to work pro bono to review all the tens of thousands of applicants. For those considered deserving, petitions are prepared by the lawyers and sent to the Department of Justice for review. Those deemed worthy by DOJ are then referred to White House counsel, who make the final recommendations to the president. But remember that you have the capacity to make good choices…I believe in your ability to prove the doubters wrong, so good luck and Godspeed. Former President Bill Clinton was highly criticized for a slew of 140 pardons issued on his final day in office, including fugitive Marc Rich, whose wife contributed significantly to the Clintons.